This is a mirage brought to you courtesy of clever advertising, political spin, and billions of tax dollars spent on things to buy votes that Canada doesn’t need. Against overwhelming facts and data, the Harper Conservatives cling to the wholly ridiculous notion that they have credibility on matters of economic management. This narrative has not been unique to Canada. Republicans south of the border have been saying that for years. And there, too, the argument is belied by the facts. In the United States, the granddaddy of fiscal conservatives, Ronald Reagan, presided over soaring spending increases and record tax decreases, racking up a deficit of $200 billion. George H. W. Bush left a $300 billion accumulated deficit, while his son, George W. Bush, gave the rich the largest tax cut in U.S. history. The younger Bush’s tax-slashing, big-spending ways left his country with a record $482 billion deficit, two wars, and a financial system in tatters. By contrast, that “tax-and-spend liberal” Bill Clinton left office with a $200 billion surplus. In Canada, the story is much the same. In their 10 years in office, the Progressive Conservative governments of the 1980s never once presented close to a balanced budget. In 1993, the Liberal government of Jean Chrétien inherited an accumulated deficit of $487.5 billion. At the time, this represented approximately 72 per cent of the GDP. It was under the Liberal watch that the tough job of chipping away at those deficits began. In 1997, the government posted a surplus - the first in decades. And a surplus remained until 2007, when the country went back into the red barely a year after the Harper Conservatives took office. Canada’s Public Accounts underline the point: as a share of the GDP, net debt in 2006 was 32.8 per cent, and down 41 percentage points from its peak of 73.9 per cent on March 31, 1996. Canada’s balance sheet was repaired by the Liberal governments of Chrétien and Paul Martin. They accomplished this through tight management of program spending, some program cuts, revenue increases, expanded trade and a growing economy. So much for those “tax-and-spend Liberals”. Since it was elected in 2005, Harper’s Conservative government has reversed that positive trajectory through needless and expensive tax cuts in the wrong places, tax increases in the wrong places and spending increases everywhere else. This gross mismanagement didn’t start with the mind-blowing $1.3 billion price tag for two days of meetings, the $16 billion for untendered jets to fight the Russians, or the $12 billion for new prisons to deal with a declining crime rate. Under Harper, the federal debt grew by $5.8 billion in 2008-09 and by $53.8 billion in 2009-10, and is expected to grow by $49.2 billion in 2010-11 and to continue growing through 2014-15 at least. In just three years, all the debt repayment of the previous eight years will be wiped out. 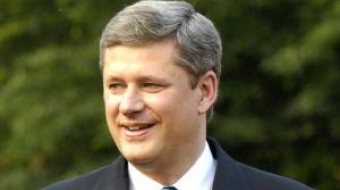 Before the recession of 2008, Harper presided over double-digit increases in government spending. Last year, he took Canada into the deepest deficit in its history to deal with pressing national priorities such as outdoor toilets, gazebos in Tony Clement’s riding, nature trails, swimming pools, and of course, lots of new hockey and curling rink roofs. Of course, let’s not forget the $100 million for government advertising and those thousands of snazzy “Made in the USA” “Economic Action Plan” signs. Spend our money like it’s going out of style for stuff that doesn’t do much, if anything, to enhance our national competitiveness and productivity, and then throw it back to us with big cheques bearing the Conservative Party logo to take credit for it. That’s a plan only a “competent manager” like Harper could love. Unfortunately, facts have a nasty habit of getting in the way of a good photo-op. And by the way, those too are funded by the taxpayer. Before the credit crisis hit the global economy in mid 2008, Canada had the worst economic growth in the G7. Canada has now experienced nine consecutive quarters of zero or negative labour productivity growth. This is the worst record since Statistics Canada began collecting this data in 1980. The U.S., despite its economic troubles, has significantly outpaced Canada in productivity, increasing its competitive advantage in global markets. As the Conference Board of Canada notes, "the failure to boost productivity substantially means lower real wages and incomes for Canadians." In 2008, Canada’s level of productivity was US $35 in terms of output per hour worked – much lower than that of the United States, at US $44. This earned Canada a startling 16th place among its 17 peer countries on the level of labour productivity. Only Japan was lower. Worse still, Canada’s productivity level has fallen to 80 per cent of the U.S. level from a high of 90 per cent in the mid 1980s. The gap between Canada and the U.S. is widening, not narrowing. Canada’s dismal labour productivity is hurting our international competitiveness and standard of living. Productivity has become the seminal economic issue of our times. Yet the Harper government has shown no leadership on that question whatsoever, despite the fact that there is no greater challenge to Canada’s future economic prosperity. During the Harper years, our manufacturing base has been rapidly eroding, productivity has taken a sharp decline, and unemployment is over eight per cent. Last quarter, Statistics Canada reported on Canada’s July trade numbers. It showed a widening trade deficit with the world of $2.7 billion, which makes it the largest deficit since the agency began to track the figure in 1971. The upshot of Harper’s economic management? Canada’s job performance is weak, our fiscal situation is deteriorating, trade is suffering, productivity is lagging, the federal government’s spending spree continues. Stephen Harper a political careerist. And political careerism is based on short-term expediency in the pursuit of long-term survival. It stresses political survival at all cost. When that’s the game the Harper government plays with our future, where does that leave our long term national interest?